Encephalitis continues to be one of the most dreaded diagnoses because a high rate of morbidity and mortality are accepted even before starting the treatment. Most encephalitis cases occur in rural areas due to poor environmental sanitation, high-vector density, shortage of protected water supplies and lack of health education. Vaccination, environmental sanitation, vector control, health education and attention to prompt diagnosis and treatment in rural hospitals are the four essential pillars for reducing case fatality rate (CFR) of encephalitis. Frequently, virulence of the virus, immunological state of the host, unavailability of antiviral drugs and lack of enough tertiary care hospitals (TCH) are not responsible for the high CFR. Basic supportive care is not being practiced meticulously in Primary and Secondary Care Hospitals (PSCH), and their services are not being utilized fully. Main causes of high mortality and morbidity rates are hypoxia and ischemia of brain and other organs precipitated by preventable, controllable or treatable complications due to lack of basic medical and nursing care during transport to the TCH. Undiagnosed Rickettsial infections are suspected to be partly responsible for the high CFR in some areas. Improving rural hospitals and their ambulance services are the most economical way to reduce CFR. "Treatment facilities must be made available at places where cases occur." The best way to reduce CFR of encephalitis in developing and underdeveloped countries is to increase and improve PSCH and sensitize politicians, administrators, medical/nursing professionals and more importantly to impress and convince the public to utilize them. The effective functioning of any health system requires an efficient public health service. Every human being has the right to enjoy "the highest attainable standard of health," which can be fulfilled by giving every man an affordable and equitable health system he deserves and demands. In these years, complex health changes have complicated the situation in India. Most important gaps in the health care include an understanding of the burden of the disease and what leads to and causes ill health, the availability and use of appropriate technology in the management of disease, ill health and health systems that have an impact on service delivery. Universal Health Coverage (UHC) has the potential to increase economic growth, improve educational opportunities, reduce impoverishment and inequalities, and foster social cohesion. Steps taken for achieving UHC will address the public health challenges and vice versa. Universal health coverage (UHC) is the means to provide accessible and appropriate health services to all citizens without financial hardships. India, an emerging economy with demographic window of opportunity has been facing dual burden of diseases in midst of multiple transitions. Health situation in the country despite quantum improvements in recent past has enormous challenges with urban-rural and interstate differentials. Successful national programs exists, but lack ability to provide and sustain UHC. Achieving UHC require sustained mechanisms for health financing and to provide financial protection through national health packages. There is a need to ensure universal access to medicines, vaccines and emerging technologies along with development of Human Resources for Health (HRH). Health service, management, and institutional reforms are required along with enhanced focus on social determinants of health and citizen engagement. UHC is the way for providing health assurance and enlarging scope of primary health care to nook and corners of the country. Background: The objective of this study was to assess health-related quality of life (HRQOL) of pediatric cancer patients and their parents in North India. Materials and Methods: Seventy-five cancer children were assessed for HRQOL, using Lansky play performance scale and health utility index-2 (HUI-2). Fifty-seven patients were followed-up after 4 months after therapy and reassessed. Their parents were also assessed using World Health Organisation (WHO) QOL BREF. Seventy five controls were also assessed and compared. Results: Lansky and HUI-2 scores of patients, as well as WHO QOL BREF of parents were significantly poor in cancer patients when compared to controls. There was significant improvement after therapy in patients with lymphomas and miscellaneous tumors. Pain and self-care were found to be maximally affected domains on HUI-2. Conclusions: Large prospective multicenter studies may be undertaken and hence that need based interventions can be planned. Background: India's growth hype and dream of emerging as an economic superpower are being challenged today, among other things, by its failure to foster an inclusive growth path and provide to bulk of its population basic amenities of education and health. There exists great inequality at interstate and intrastate level in terms of the key components of human development-health and education. Aims: The present work attempts to measure the extent of the inequality in health status and health care services in the two most populous states of India namely Uttar Pradesh and Bihar. Materials and Methods: A detailed analysis of interdistrict and interregion disparity in health status and health care in the two states has been done using secondary data from Annual Health Survey (2011) and Statistical Diary (2011). Composite indices of health status and health services have been developed using Maher's normalization technique and principal component analysis. Inequality measures like co-efficient of variations have been used to measure the relevant disparities in the two states and explain the reason thereof. 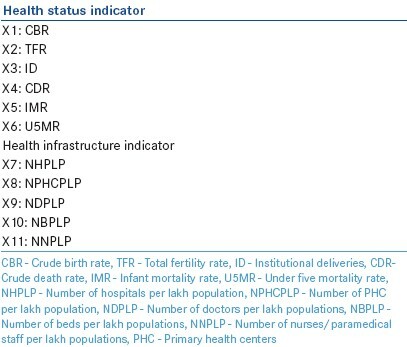 Results: The work shows low overall health status and wide interdistrict and interregion health disparity in the two states with lower disparity in Uttar Pradesh as compared to Bihar in terms of health status and relatively high disparity in health infrastructure. One startling fact is existence of very low and insignificant correlation between infrastructure and outcome. Conclusion: The study finds health status is influenced not only by health care facilities, but a number of other factors principally government's commitment and policies. Background: Practicing behavior of the physicians varies from population to population due to diverse socioeconomic, cultural, and professional factors. Evidence on these issues is almost nonexistent in the developing countries. Objective: The prescribing behavior of diabetes treating physicians working in selected hospitals of the Diabetic Association of Bangladesh was studied along with the factors affecting those behaviors. Materials and Methods: This was an observational study on 818 prescriptions given by 49 physicians working in 16 health care facilities, which were photocopied by a portable photocopier. The various components of the prescription were scrutinized for presence and absence, and evaluated independently by two expert Diabetologists for their qualitative aspects. Results: The mean ± standard deviation of the total prescribing score (expressed as percentage) was 60 ± 11. Physicians scoring around or below 60% belonged more to lower age (<40 years), less experienced (<7 years) and mid-position (Senior Medical Officers) groups. Most of them also had public medical college background. Physicians with Certificate Course on Diabetology (CCD) had significantly higher score compared with the Non-CCD group (P < 0.001). Direction and duration of drug use were absent in majority of prescriptions (72.0% and 61.6%), respectively. Symptoms were not written in 78.0% and the family histories were not recorded in 98.5% prescriptions. Diet (49.4%) and exercise (51.0%) related advices were not mentioned in a large number of prescriptions. Appropriate change of drug (78.2%) and proper use of drug (99.1%) and brand (93.8%) were found rational, but still, 22.4% of the prescriptions found illegible. Conclusion: A large proportion of prescriptions in Bangladesh related to diabetes care still lack standardization and acceptable quality. Nondrug related issues (such as history, symptoms, and dietary/exercise-related advices) are the most neglected ones in a prescription. Background: There is scarce Indian data on time trends of hepatitis, an impediment to formulate an effective public health policy on the matter. Objective: The aim was to study secular trends and burden of hepatitis in a railway population. Materials and Methods: Outdoor, indoor, endoscopy unit and mortality records of patients attending this hospital from January 2003 to December 2011 were searched manually and relevant parameters of hepatitis patients were noted, especially etiology, clinical features, treatment, and mortality. Cochran-Armitage trend test was used to test significance of any trend in these parameters. 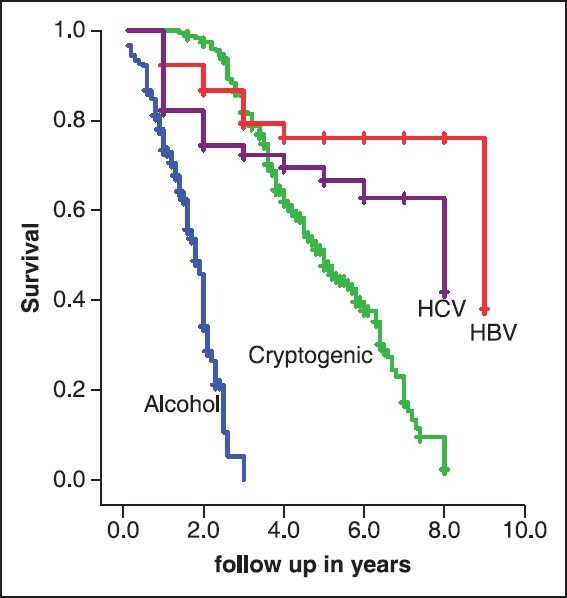 Binary logistic regression analysis of various factors was carried out to study their effect on the liver related mortality of hepatitis B and C cases and Kaplan-Meyer survival curves were generated for significant factors. Two-sided P < 0.05 was considered to be significant. Result: Chronic liver disease (CLD) due to alcohol showed a significant rising trend with early age (mean 48.4 years) and high percentage of decompensated disease (75%) at presentation and high early mortality (63%). No trend was observed for hepatitis B and C, but significant reduction in mortality was observed when definitive therapy was given. Cryptogenic CLD showed a decreasing trend though overall it still remained the most important etiology and survival was better compared with alcohol even with conservative therapy. Only 4% patients had hepatocellular carcinoma. Conclusion: A menace of alcohol related liver disease affecting young productive work force in this part of India is foreseen, which might impact the country's economy and mandates immediate containment policy. Globally, 1 billion people live in slums. There are few reports of high prevalence of noncommunicable disease (NCD) risk factors among the urban poor. 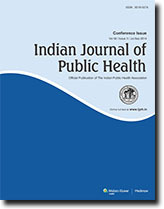 The prevalence of NCD risk factors in the slums in North 24 Parganas, West Bengal, India was estimated. Cross-sectional survey in 24 slums selected using cluster sampling method was conducted. Questionnaire for behavioral risk factors was used and anthropometric and blood pressure measurements were done. The study population included 1052 participants aged 25-64 years, 528 (50%) were males. Among males, 206 (39%) were current smokers and 154 (29%) were current alcohol users. Central obesity was prevalent among 32.8% males and 56.1% females and 115 (10.9%) had body mass index ≥27.5 kg/m 2 . Hypertension was prevalent among 35% males and 33% females. We observed high prevalence of NCD risk factors among urban slum dwellers that need to be addressed with health promotion programs and strengthening of primary health care system. Obstetric near-miss (ONM) describes a situation of lethal complication during pregnancy, labor or puerperium in which the woman survives either because of medical care or just by chance. In a cross-sectional observational study, five factor scoring system was used to identify the near-miss cases from all the cases of severe obstetric morbidity. Assessment of the causes of maternal mortality and near-miss obstetric cases was done. The ONM rate in this study was 4.18/1000 live births. Totally 54 maternal deaths occurred during this period, resulting in a ratio of 202 maternal deaths per 100,000 live births. Hemorrhage, hypertension and sepsis were major causes of near-miss maternal morbidity and mortality, respectively in descending order.